We only needed to write those two words and you know exactly to whom's face they belong to. The fallen Jedi and one of the great Sith Lords, Darth Vader is one of the most famous movie villains of all time. His imposing presence, magical powers which include the infamous ability to force choke a man just by thinking about and ultimately tragic personal story have inspired all kinds of acclaim and a place in most Star Wars fans hearts. But enough of this chit chat, here’s 11 crazy stories, facts and myths about Darth Vader that any Star Wars fan would be keen to know! 1. While Lucas had said post release of A New Hope that he had 9 Star Wars movies all mapped out, he didn't really. It was only on when developing the second draft of Empire Strikes Back with Leigh Bracket that Darth Vader became Luke's father. Indeed, in original drafts of A New Hope, Vader and Anakin Skywalker were different characters. 2. The famous reveal of the father and son relationship between Vader and Luke is often misquoted as "Luke, I am your father". The line is actually "No, I am your father". It's kind of like how Star Trek's Captain Kirk never actually said "Beam me up, Scotty". 3. The character of Vader has been played by several actors. In the original trilogy David Prowse is famous for wearing the suit and Sebastian Shaw as the 'face' of Vader in Return of the Jedi. The prequels saw an idealistic Jake Lloyd tackle Anakin in The Phantom Menace and Hayden Christensen covered the next two movies as well. Bob Anderson also stepped in for sword fighting scenes and C. Andre Nelson helped out a bit with the redux versions of the original trilogy. 4. Hayden also appeared as the costumed Vader in Revenge of the Sith. He apparently begged Lucas to let him play him. The suit had to be designed to accommodate his smaller stature than Prowse's. 5. While Return of the Jedi saw Luke return the favour to Vader and cut his arm off, the idea for it actually came from the expanded universe novel, ‘Splinter of the Mind's Eye’. This book was intended to be turned into a sequel to Star Wars but when that movie became so popular, the idea was abandoned. 6. Vader was actually the only Star Wars film character to lose an arm three times! And both his legs as well. Obi Wan Kenobi got 3 of his limbs in Revenge of the Sith! (he had the higher ground...). 7. Darth Vader was referenced in the film Back to the Future by Marty McFly as being from the planet Vulcan. No one was sure who was more upset - Star Wars fans or Trekkies! 8. Vader has his own theme song written by John Williams. Known as the Imperial March it was introduced in the Empire movie and used in Jedi and in the prequels to show when Anakin was turning to the dark side of the Force. 9. 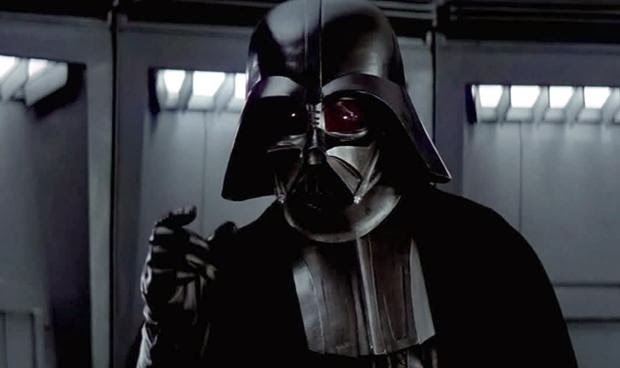 James Earl Jones is famed for providing the voice for Vader however he didn't do the famous breathing sound effect. This was done by the now famous Ben Burt placing a microphone inside the mouth piece of a breathing apparatus and recording it being used. Burt has since become world reknown for his sound recording skills and I believe he worked on every Star Wars movie to date. 10. George Lucas at one stage considered using the great Orsen Welles as the voice actor for Vader. Welles eventually voiced the planet destroyer Unicron in the animated Transformers movie. 11. Anakin Skywalker really is the ‘Chosen one’. While Yoda and Obi Wan may have thought a mistake had been made in the reading of the prophecy, Anakin was the one who actually killed Sith Lord Palpatine by throwing him down the Death Star’s reactor shaft in Jedi and thus restored balance to the Force. Bonus fact - Darth Vader only appeared on screen in A New Hope for a total of 12 minutes. It's amazing that for such a short amount of screen time that his character become one of the most loved bad guys in movie making history! We think these were some pretty cool bits of trivia about the Dark Lord.